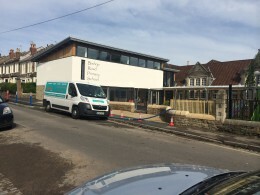 Aquadri carpet cleaning were contacted to clean the carpets at Bishop primary school, which is the largest primary school in Bristol. During the school summer holiday break, a new heating system had been fitted and the building works required to complete the installation had taken its toll on the carpets. On top of the previous terms daily quota of dairy stains and dust, the carpets were indeed in need of some expert attention. Needless to say, although it took some time, the the carpets came up well, as you will from the pictures. Interesting fact: We didn’t realise until later but Cary Grant, Paul Dirac, John Polkinghorne and Ben J. Green were all educated at this school! The carpets look like new after we apply our cleaning expertise to them!